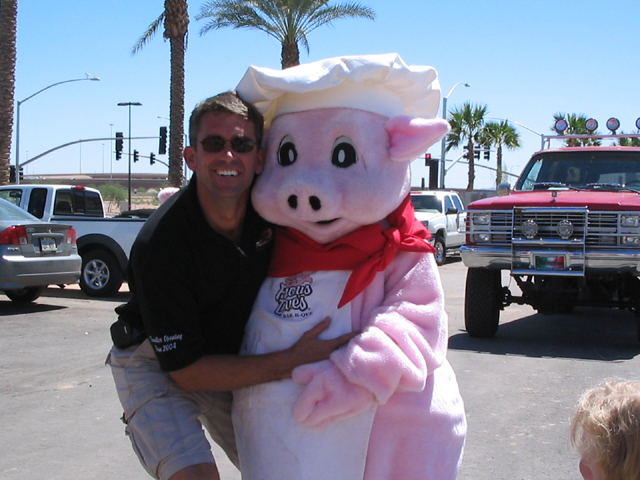 Famous Dave’s was my first real PR job when I started my business. I helped them get exposure for the opening of the Peoria location and been working on special projects for the local owner, John Erlandson for years now. He is one of the most community-minded owners I have ever met. He is SO good to the local charities in town and always does what he can to lend a hand. Famous Dave’s may be a “chain” but the owner of the ones in the Valley is completely and totally about the local community. I highly encourage you to support the restaurant and all they do to help the local police, military and other charities in town. This event is a tasty idea for you. Put Famous Dave’s on your calendar for Saturday, July 19th! The Arizona Department of Veterans’ Services and Famous Dave’s are teaming up to help Arizona’s Military families in need. Receive a FREE gift for every BBQ Tour ordered! The Famous Dave’s BBQ Tour consists of three St. Louis-Style Spareribs slathered in Rich & Sassy Sauce, juicy Georgia Chopped Pork, Texas Beef Brisket, corn-on-the-cob, cornbread muffin, choice of two sides and Strawberry Shortcake. The Arizona Military Family Relief Fund offers a way to support local families of service members during times of crisis. The fund provides stipends for military families whose loved ones were injured or killed fighting the Global War on Terror. By law, 95% of all donations go directly into the hands of military families in need. This entry was posted in blog and tagged barbeque, bbq, family, FAMOUS DAVES, glendale, MESA, military family, peoria, support military. Bookmark the permalink. One Response to "Eat BBQ to help Military Families"
Thank you, Mr. Erlandson, for sponsoring this event!